In the space of a week, Romelu Lukaku and Paul Pogba have been linked with moves away from the club. They have inadvertently let their intentions become clear. Both are the most expensive outlays in the club’s history and after a relatively short stay, it could be adiós in the summer. Real Madrid seem to be set to spend big with Zinedine Zidane at the helm. Defender Eder Militao has already joined and Eden Hazard has been strongly linked for a while now. Real are rumoured to be ready for an all-out transfer assault on Europe’s top talent. This was after Pogba had said during an international break press conference (via ESPN) that playing for Real Madrid, “is a dream for every kid, for every football player. 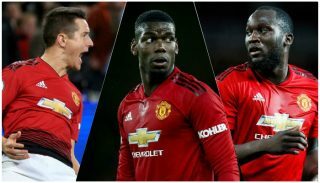 It should be noted that Paul Pogba also said in the same press conference that he was ‘happy’ at The Theatre Of Dreams. In my view, Pogba can easily avoid this subject by just not answering that question at all. He is media savvy enough to know how it will be interpreted and how it would look to United fans. His performances over his entire Reds career hasn’t been good enough and his tumultuous relationship with Jose Mourinho is still fresh in the mind. Ole Gunnar Solskjaer defended him saying in the press conference before the Premier League fixture to Wolves, as per the Metro: “Paul is a very nice and polite man who then answered a general question on Zidane, who is an icon in France—a fantastic manager and used to be a fantastic player. Although undoubted talent, for me, it has never really felt like he has the club’s best interests close to his heart. Rumours of a move never seem far away (which I concede may not be his own doing) and it all seems detrimental to the team. When we have needed a bit of urgency or leadership he has ultimately failed. We are all willing him to become the player he is destined to be but it seems to only happen for short spells during a whole season. The man we saw leading the French dressing room during the World Cup doesn’t seem to exist at Old Trafford. I know this may sound a tad harsh on a very talented player but with these constant rumours and speculation, United should demand more. It could be argued that he doesn’t have the right players around him to produce his best and I wouldn’t disagree too much with that. Pogba seems to do better when Marcus Rashford is the man up top rather than the lumbering Lukaku. This brings us nicely on to the recent calculated comments from Romelu Lukaku’s agent, Federico Pastorello. Pastorello told Sky Sports: “He likes Italy. When he was a child he followed a lot the Italian league. Everybody agrees today the Premier League is the best but years ago Italy was the best and they were the dreams for the younger footballer players. The timing seems strange when we are fighting for fourth place and have a very important Champions League tie against Barcelona. None of any of this does us any favours. 42 goals in 90 appearances is a very good stat on paper but United’s number 9 just hasn’t hit the heights of popularity with the club’s fan base. Under Solskjaer, he is in direct competition with Manchester, born and bread, Marcus Rashford. Although he has scored a lot of goals recently, he is susceptible to some glaring misses as well. For every goal there is a missed chance never far away. In comparison, Lukaku can’t be considered in the same league as Harry Kane and Sergio Aguero. Top shelf strikers, deadly in front of goal. The Belgian certainly has an excellent scoring record but he doesn’t get considered in today’s elite finishers. Kane and Aguero are light years ahead of Lukaku in terms of touch, movement, strength and coolness in front of goal. Andy Cole in his first few seasons was similar in respects of needing a lot of chances before converting. Cole was an all round better player though. Lukaku loses a lot of aerial battles and his hold up play is non-existent, unlike Cole. The most ruthless striker United has in recent memory has to be Ruud Van Nistelrooy. It’s unfair to compare them as they are different players but in terms of getting an opportunity and taking it, there is only one king. If Ruud missed a chance he wouldn’t make the same mistake again. The same could be said of his Dutch compatriot Robin Van Persie. United just don’t have the same player but to be fair there isn’t much of those type around. United’s time of need is now. The Reds need committed players that won’t talk about desires of joining other teams. BBC Sport reported that six players were set to leave the club in the next transfer window. One of those could be Ander Herrera. The Spaniard is a player that is strongly rumoured to be on his way to PSG. He hasn’t commented on his future and is a player that, given the chance, will exceed all expectations. I’ve talked in previous articles about this summer being our most important for years. The club is talking a big game right now and Ole has made his intentions clear. Hopefully, for the fans, the talking stops and the club’s actions will speak louder than words.